Italy’s populist movement isn’t like the others in Europe. And that’s worrisome. 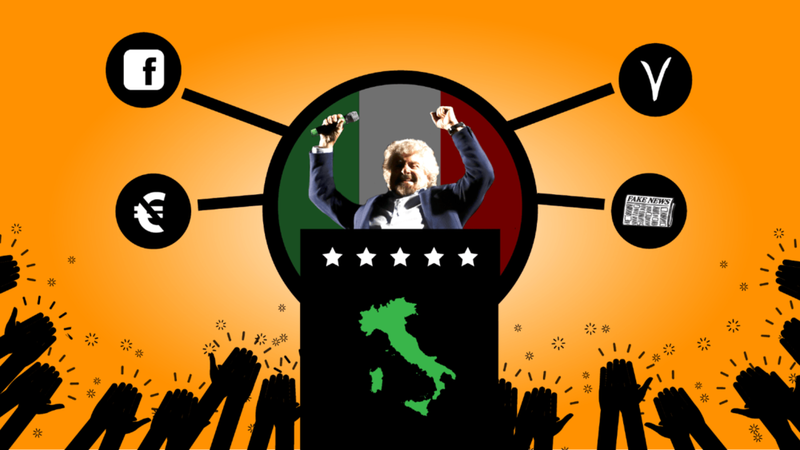 MILAN, ITALY — The far-right populist wave that has swept Europe and the United States since 2016 has a major foothold in Italy, where the 5 Star Movement (Movimento 5 Stelle) has quickly emerged as the country’s most popular party. The M5S isn’t a typical far-right party. In fact, on issues like environmental protection, public water, and sustainable transport, it can often sound downright left-wing. But while it may seem like a breath of fresh air to have an anti-corruption, environmentally-conscious party leading in polls in a major European nation, don’t inhale too sharply just yet. Because while the party’s attitude toward the environment and public welfare recalls Bernie Sanders, its views on immigration, refugees, the euro, and improved relations with Russia more closely resemble those of far-right French leader Marine Le Pen. The M5S was formed in 2009 by Beppe Grillo, a popular comedian and blogger, and Gianroberto Casaleggio, a web strategist. Grillo, 68, became famous in the 1980s for his stinging political satire of Italy’s leading politicians. In 1987, he was banned from television for offending then-Prime Minister and Socialist Party leader Bettino Craxi. He then remained out of the public eye for almost 20 years. He reemerged in 2005, when he crowdfunded a full page ad in Italian newspaper Repubblica calling for the resignation of then-Italian Central Bank Governor Antonio Fazio. Thanks to that audacious move, Time Magazine named him one of its European Heroes. That same year, Grillo purchased a full page ad in the International Herald Tribune that demanded a ban on parliamentarians with a criminal record — no matter how small. Italy’s convoluted political process makes progress hard to come by. Tax evasion and corruption are common practices in government, and the M5S’s opposition to such practices — paired with its adept use of social media — has spurred a furious rise to the head of Italian political polls. Grillo and Casaleggio initially organized meetings on the site Meetup.com. They coalesced activist groups on campaigns and local issues and then used the popularity to field candidates for elections. They focused heavily on corruption and gained support by advocating cuts to parliamentarian salaries. The M5S grew quickly by exploiting people’s legitimate grievances with traditional political parties and through their successful manipulation of the internet. They drew support from people from both traditional left and right constituencies, and across social and class lines. Running as a party opposed to the establishment in 2012, the M5S won mayoral races in three small cities and Parma, a provincial capital. In 2013, the M5S was the most voted for party in Italy, not including votes from abroad. But the Italian electoral system, which heavily favors traditional parties, saw that only 109 of 630 deputy positions were granted to the M5S. Rome, long dominated by establishment parties, fell to the M5S in 2016 when Virginia Raggi became its mayor. The party has maintained around 30 percent of the country’s support ever since. Today, Grillo’s blog, which publishes in three languages, is one of the 10 most visited websites in the world. He’s used it to drum up support for M5S while also spreading fake news and pro-Kremlin propaganda. The name M5S comes from five key issues it claims to focus most on: public water, sustainable transport, sustainable development, the right to internet access, and environmentalism. The movement has also regularly promoted nonviolence, and opposes European austerity measures and foreign interventions. (It was against Western intervention in Libya and continues to speak out in opposition to American intervention in Syria.) The M5S also has said it wants to distance itself from the United States and improve relations with Russia. The movement claims to be neither right nor left, though they borrow from both sides. They claim they are populist, anti-establishment, and Euro-skeptic but place a heavy emphasis on environmental issues and take what could be defined as a leftist position on austerity. They’ve also called for a referendum on whether to abandon the euro. Direct democracy is central to M5S rhetoric. But since Casaleggio’s death in 2016, Grillo has consolidated power in the movement and taken a more authoritarian approach to party rule. Many members have left in recent times after being told to either fall in line with Grillo’s positions or be expelled. These days it seems the movement’s positions are Grillo’s positions and vice versa. “All M5S MPs have to sign a contract that demands they strictly follow the leadership’s line,” Buzzfeed reported last year. Given who Grillo counts among his friends, that potentially means joining an alliance with some seriously unsavory characters. Grillo has spoken glowingly of Nigel Farage, former head of the British right-wing populist party UKIP. Farage — who also advised President Donald Trump’s 2016 campaign and is a current Fox News contributor — was one of the main advocates behind the United Kingdom’s exit from the European Union. Shortly after the Brexit vote, he made his own Brexit and moved to the United States — just in time to attend Trump’s inauguration. Grillo also supported Trump in the U.S. elections. He refused to pick a side in the French elections, though his view of immigrants is more aligned with that of the loser, Marine Le Pen. Grillo compared migrants to rats in a tweet in 2015, suggesting that Rome could be “swamped by rats, rubbish and illegal immigrants.” Recently, members of the M5S have started spreading a conspiracy theory about aid workers colluding with human traffickers to make money and destabilize Europe. Shortly after Sadiq Khan became London’s first Muslim mayor in 2016, Grillo drew criticism for asking when he would blow up Westminster. Like many other populist movements, the M5S entered European parliament in recent years. Once ensconced in Brussels, they tried to join a bloc of left-leaning parties, but were rejected. Instead, they carried on in their current bloc, which includes UKIP. The M5S seem poised to do well in Italy’s next general election, which is set to be held in 2018. But as Brexit supporters and the Trump administration are now learning, it’s harder to placate anger and disenchantment than it is to rile it up. Fulfilling their promises to voters would be especially hard for the M5S, which has vowed in the past not to join in coalitions with other parties. In Italy’s divided political landscape, it would be impossible to form any sort of government without other parties. “They, like anyone else, may struggle to govern,” Garavoglia said. But votes for the M5S may be less about the expected outcome and more about trying what many Italians feel is their last option. “It’s less love of the M5S and more ‘we tried everyone else’,” Garavoglia said.